Regulatory capture of governmental agencies has reared its ugly head again. It is important to note that formaldehyde also makes an appearance in U.S. food (such as some beer) and some personal care products (such as hair dyes and relaxers) as certain levels are permitted by the FDA. For more information on where formaldehyde is hiding and what the scientific evidence says about the potential harm to human health see our Food Additives to Avoid List [FATAL]–and of course there is more information in our book. 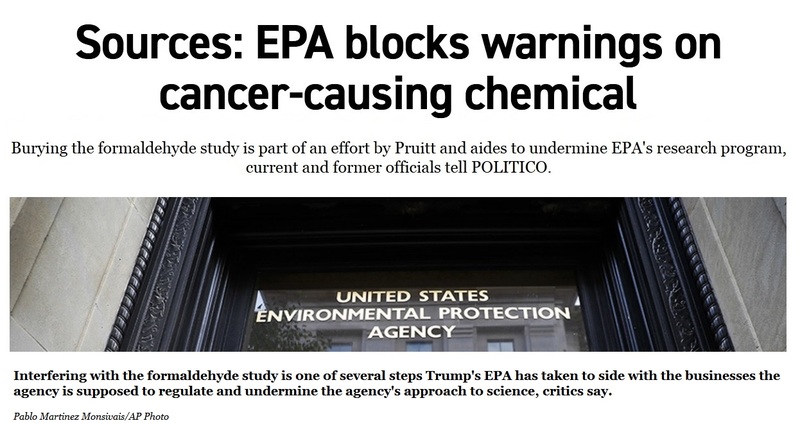 Burying the formaldehyde study is part of an effort by Pruitt and aides to undermine EPA’s research program, current and former officials tell POLITICO. Read more on the politics behind this decision here.